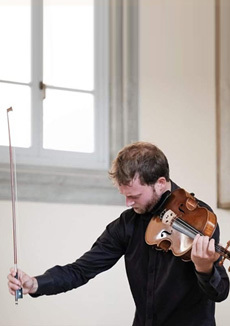 Born in Rome, Daniele Valabrega attended the viola class of Luca Sanzò at the Conservatorio di Santa Cecilia and obtained his diploma in 2015 with high marks. He lives in Cremona where he studies with Bruno Giuranna in the Walter Stauffer Academy and attends master classes with Francesco Fiore at the Instituto Superiore di Studi Musicali. His chamber music experience includes viola and piano recitals for the Primo Riccitelli concert season, the Classica sul Tevere, the Società dei Concerti, and the Società Umanitaria in Milan, as well as many other concerts with a variety of ensembles.